Hillary Chybinski: announcing. 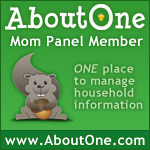 . .
i am beyond thrilled to share with you all that I was selected as an AboutOne Mom Panelist. I hope you will join me on my adventure exploring this amazing service and the company behind it.